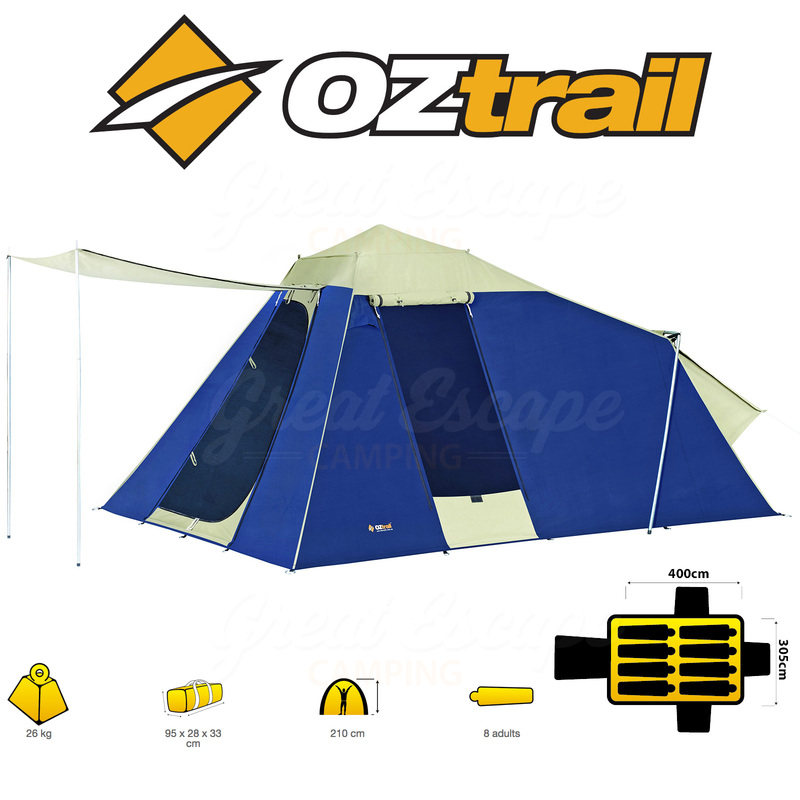 Get heaps more room, but maintain the speed and ease with which the Oztrail Tourer tents set up. 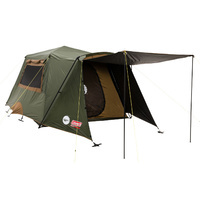 SatProof Canvas is a blended cotton canvas used in a variety of material weights depending on the design requirements. The anti-mildew water proofing agent is saturated throughout the canvas before manufacture so even after wear and tear it will still provide a waterproof barrier. 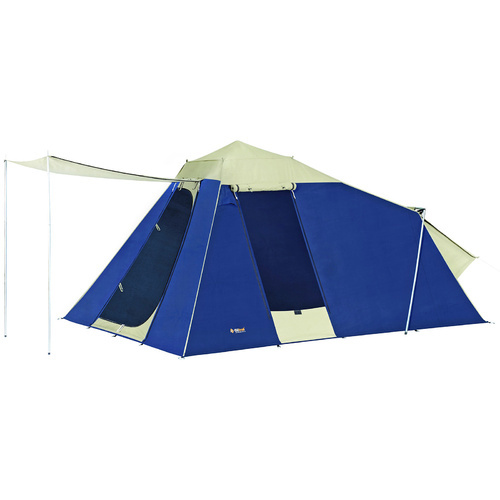 SatProof Canvas creates a waterproof canvas that minimises condensation build up, while the structure of cotton allows water vapour molecules to pass through and at the same time provide a barrier to water droplets. The roof fabric in the Cabin Tent is rolled under pressure to accept a silver coating that blocks out more than 98% of UV radiation and heat. The technology used in this protective coating has been developed to provide a level of finish never before seen in a canvas product. It is vitally important that you season your canvas when it's new and also after long periods of storage so it gives its best performance. 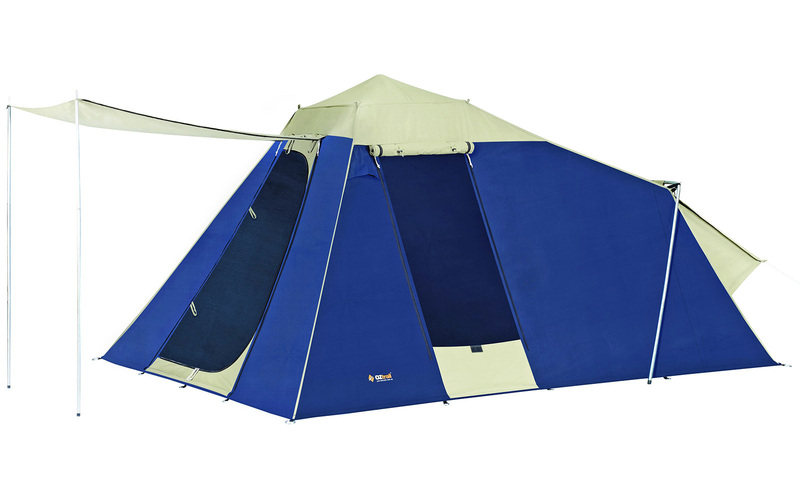 Simply pitch your tent or swag and wet it down with a garden hose. This enables the stitching holes to shrink around the thread of the stitch lines and the cotton in the canvas to swell. Let the canvas dry completely before repeating this two or three times. Even though you may have seasoned your canvas, sometimes you can miss a spot or a seam. An age old remedy if this happens is to carry a clear wax candle with you when you go camping. If you do notice a seam has not been seasoned properly, simply rub the candle on the exterior of the stitch line. This will create a waterproof barrier quickly and easily. 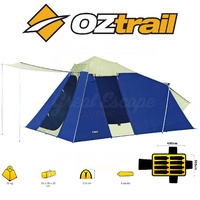 If cared for correctly, your OZtrail canvas will still be around for the next generation of campers to enjoy. 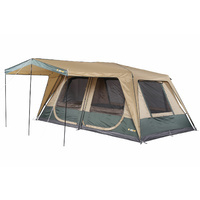 Design Classic bus or tourer style tent designed to make travelling easier with enough room to fit a queen size mattress. Simple, single pole setup with rapid pitch setup. All-weather gusseted rear window for complete climate control. Canvas Walls: 340 gsm SatProof 600+ Ripstop Canvas. Roof: 340 gsm SatProof 800+ silver impregnated canvas for superior waterproofing, anti-mould & UV protection. Door DuoDoor™ - combines mesh & canvas zippered panels allowing effortless access by operating a single zip. Easy Step D Door - Oversize D-shaped door for easy access to the interior with lower sills to minimise tripping. Mesh Windows No-See-Um Mesh - Ultra-fine mesh panels for total insect protection, no matter how small they are, while still allowing plenty of ventilation. Gusseted panels over rear window keeps rain out when the windows are pegged open for great ventilation no matter the weather. Environmental Control Large No-See-Um mesh windows and Duo Door allowing you to open door or window independently with easy single zip access. Water Lock roof to wall seams - an inverted seam system which makes the water run off rather than collect and pond in the seam. 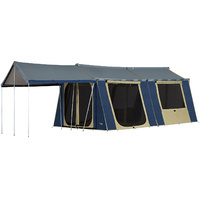 Large side awnings for extra cover / ventilation. 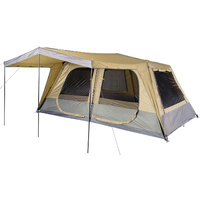 Zipper storm flaps provide all weather protection to prevent water entry through the zipper. Triple layer Insulcell roof keeps you cooler in summer & warmer in winter. Pegs and Guy Ropes Pre-attached guy ropes & sturdy pegs included. All peg points use a stainless steel D ring, and the main peg points are sand peg compatible. 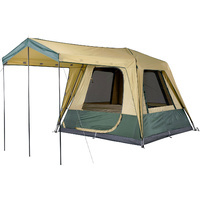 Awning Large awning with 2 awning poles provided. Warranty 2 Year Manufacturer's Warranty against defects of material or manufacture.